Joginder Singh’s strengths lie in Math, Science and Art, and his schedule reflects this. 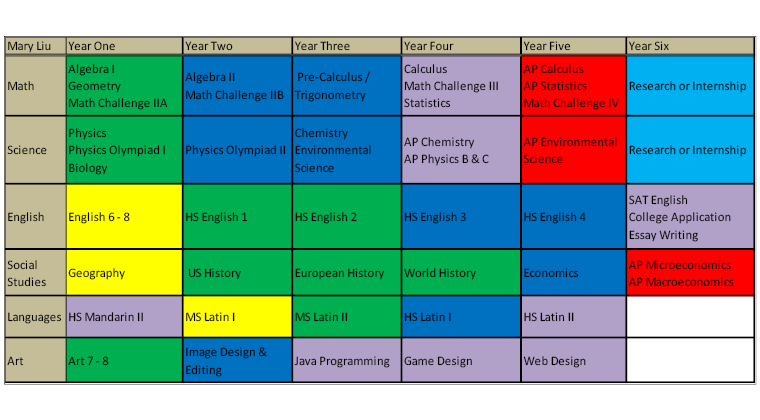 Mary Liu has strengths in Math, Science, Languages and Art, and his schedule reflects this. 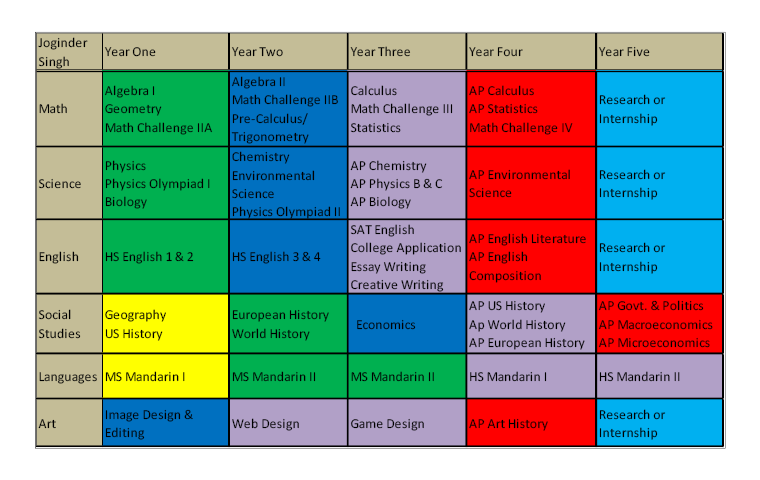 Andrew Wyatt is strong in English and Social Studies, and his schedule reflects this. In the first year, students are introduced to core subjects from every department. These are the stepping stones for more advanced classes they will take over the course of their studies. Working closely with our teachers and counselors, students will acquire the necessary preliminary skills that allow them to start thinking more critically across various disciplines. Counselors work closely with students to develop an individual learning plan. While all required curriculum is the same, the schedule, pace and composition of free electives is designed to promote individuality and student growth. We have both standard-paced live learning and self-paced courses that allow students to work at a speed that best meets their academic needs. All Areteem Institute curricula promotes analytical, logical, critical, and cross-discipline thinking. Our students are challenged to creatively tackle modern, real world problems. Students also start to explore their academic interests with awareness and perspective for career goals. Students are trained to think, read, write and analyze. Areteem Students are truly self-sufficient individuals, and are encouraged to follow academic interests and passions that help prepare them for their university of choice. By the third level, students will start to plan their future options for higher education with their counselors and prepare for examinations needed to be eligible for university. In addition to meeting our engaging curriculum requirements, students also work on major projects for each class to practice their research, analytical, extraction, and presentation skills. The last year will also prepare students for applying to the universities of their choice. With assistance from their instructors and counselors they will start submitting admissions applications and taking the all-important entrance examinations. Students will graduate from our school with a full set of skills that will lead them to success in higher education and their future careers.